Why is Laguna Beach Florida a favorite vacation destination? when the body is begging for a re-charge! When do I come here? I come back with kids when they need a boost. Like a chameleon, Laguna adapts to fit 'my' mood and it will yours, too, so come with kids, your significant or come alone! Laguna has a mild temperature all year round and is another one of the Gulf Coast’s superior sandy white beaches with peaceful azure water so it’s a great place to relax. A common family vacation destination, Laguna Beach Florida allows you to enjoy a beach just as beautiful as nearby Panama City Beach, but much quieter and less challenging when other places are full of visitors. Of course when you have recharged your batteries, there is fun to be had and many things to do with just a short drive to Panama City Florida. 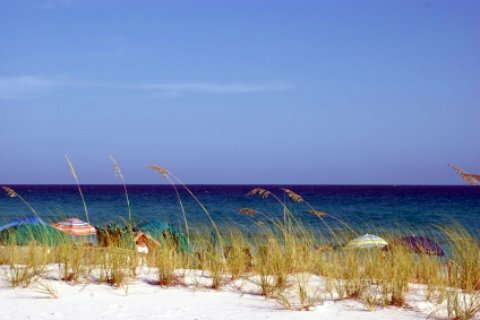 If you are driving and have the time, point your car west and check out the Florida Panhandle and some of the best beaches in Florida. In fact, check out all our articles on Northwest Florida. Enjoy some scuba diving, nature hiking, dolphin watching, or many other activities of your choosing at nearby Fort Walton Beach. At nearby Camp Helen State Park you can behold a coastal dune lake view and enjoy activities like swimming, shelling, hiking and bird watching. You can also enjoy fishing here. The entire family will enjoy a day trip (or more) to Panama City Beach for more activities and to spend some time browsing and shopping at the outdoor Pier Park shopping mall. Great for those souvenirs you promised! Kids of most ages: Take in a night time entertainment show full of your favorite water animals and enjoy an educational and scenic marine life experience during the day at Gulf World Marine Park, also located in nearby Panama City Beach. The food at Angelo's is spectacular, but it is located in Panama City as well… you may have noticed that there’s a shortage of developed places in Laguna Beach, but that’s part of its appeal! Sleeping: Camp out at the Raccoon River Campground but if you must stay indoors, try the beautiful Holiday Inn Sunspree Resort Panama City Beach.